Tracy Persico serves as a Director in Brown Rudnick’s Government Law & Strategies Group in the Hartford Office. She represents clients before the Connecticut General Assembly, as well as state and local regulatory agencies. As a registered lobbyist, Tracy represents clients in the energy, technology, telecommunications, health care and transportation industries. In addition, she concentrates on local and state government procurements and also has extensive experience working with advocacy groups and various industry coalitions. Tracy knows that in the political arena perseverance is part of the key to success, as well as timing and patience. Providing professional guidance and strategy as to how to navigate through the nuances of the political process is her specialty. 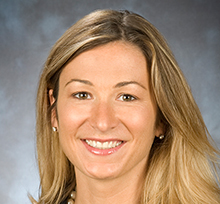 Tracy lives in New Haven, Connecticut and attended Quinnipiac University School of Law. She was admitted to the Connecticut Bar in 2008. She began her government involvement in 1997 as an assistant to the deputy majority leader of the Connecticut House of Representatives and later served as a campaign coordinator for several legislators during the 1998 elections.